It’s been over a year since we wrote our original post sharing our analysis of the last decade’s most successful U.S.-based, venture-backed tech companies. As we wrote in our original post – many entrepreneurs, and the venture investors who back them, seek to build big, impactful companies valued at a billion dollars or more. We called these companies “unicorns” because what they had achieved seemed very difficult, rare, and relatively unstudied. That billion-dollar threshold is important, because historically, top venture funds have driven returns from their ownership in just a few companies that grow to be super-successful. And as most traditional funds have grown in size, they require larger “exits” to deliver acceptable returns (Cowboy Ventures is different – we’re small by design, although we’d be happy to invest in Unicorns). Aileen Lee is founder of Cowboy Ventures, a seed-stage fund that backs entrepreneurs reinventing work and personal life through software. For example, to return just the initial capital of a $400 million venture fund, that might mean needing to own 20 percent of two different $1 billion companies at exit, or 20 percent of a $2 billion company when the company is acquired or goes public. The post and term generated more attention than expected. It’s been a nice surprise – it’s a special word for a special thing, and we love it’s not traditional business lingo. First, our project uses valuation as a filter (an admittedly imperfect one) to identify and learn from the fastest-scaling tech companies of our time. Our goal is learning, not list making. Nor is it to encourage companies to optimize point-in-time paper valuations, which have a lot of downside if they are not sustainable. 1) We found 84 U.S.-based companies belong to what we call the “unicorn club,” a jaw-dropping 115% increase from our last post. The increase is driven largely by “paper unicorns” – private companies that have not yet had a “liquidity event.” But, these companies are still a super-rarity: our list is just .14% of venture-backed consumer and enterprise tech startups. 10) There’s still too little diversity at the top. There is movement in a positive direction on gender from a zero base; and not enough data on race and other underrepresented groups. We identified 84 companies for our set (by our definition, U.S.-based, VC-backed software and Internet-oriented companies founded since 2005 and valued at over $1 billion by public or private market investors1). That’s a staggering 115% increase since our last analysis just a year-and-a-half ago. The total value of these companies is $327 Billion – 2.4x our last analysis (excluding Facebook, which was almost half the value of our last list). It’s the number of companies, not their individual valuations, driving the dramatic increase in total value. The average company value on our list is worth $3.9 billion, just an ~8% increase from last time. And it’s the number of “paper unicorns” that has dramatically increased the total value. Private companies are now 61% (vs 36%) of our list, worth $188 billion in total and $3.7 billion on average. a) Compelling products that are easier than ever to adopt through large and growing global markets, smartphones, and social networks to spread the word faster. This is driving more exciting growth, adoption and engagement numbers than ever before (A16Z’s strong presentation on the underlying fundamentals here. b) A perception of winner-take-all markets due to branding, scale and/or network effects, and intimidating, growing cash war chests (see here) driving investor FOMO, and demand to invest in ‘winners’ at almost any price (Bill Gurley has great insights about that here). c) Competitive later stage capital from more sources than ever – late stage funds, public investors investing earlier, and global strategics. These investors often have a low cost of capital which gives them a lower return hurdle than traditional venture investors; and they often receive downside protection as part of their investment that isn’t reflected in valuations (Fenwick’s great analysis of this trend here). d) Vibrant public markets fueling optimism: the NASDAQ is up 32% since our last analysis. The Verge; Josh Kopelman; Thomas Tunguz; CB Insights; and Deepak Ravchanran. Despite the doubling, building one of these companies is still ridiculously difficult and rare. If 60,000 software and Internet companies were funded in the past decade2, that means only .14% have become unicorns– or one in every 714. The odds of building, working for or backing one are worse than catching a ball at a major league game; but, better than the chance of dying by shark attack – so we’ve got that going for us, which is nice. 2) On average, eight unicorns were born per year (versus four in the 2003-2013 era) in the past decade. There’s not yet a super-unicorn ($100Bn+ in value) born from 2005-2015, but there are now nine “decacorns” ($10 billion-plus in value), 3x our last post. 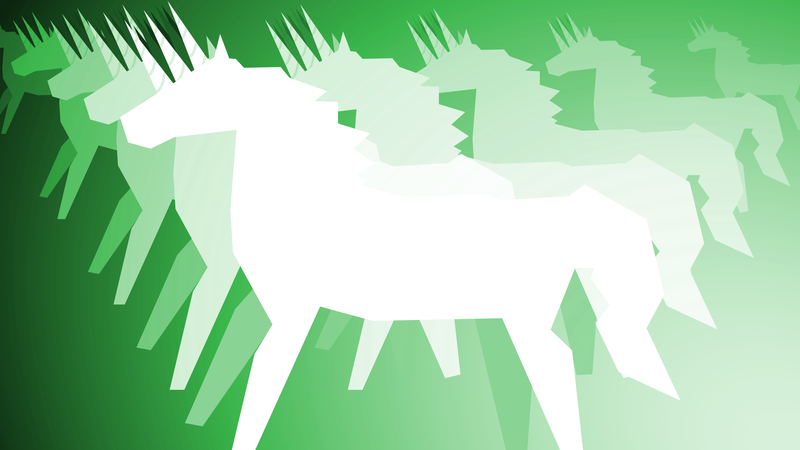 The best years to start a unicorn were 2007 (27% of companies in our set) and 2009 (18%). During these 2 years, 45% of the companies in our set were started. The best times to start a unicorn company could be a) post the launch of a watershed new tech platform; and b) during a prolonged public market downturn. Without many great jobs available, the reduced opportunity cost and related hardship may spawn great innovation and grit. To note, there are some astoundingly young companies in our set including Illumio, Oscar Health and Zenefits, all <3 years young. The combo of great products plus growing global, mobile markets may have accelerated time-to-‘escape velocity’ adoption and correspondingly, time-to-unicorn for some companies. This rapid ramp could also mean a rapid decline for other companies if customers are not super engaged and happy for the long haul. As we wrote previously, every major technology wave has given birth to one or more “super-unicorns” – companies that grow to be worth >$100B over time. Facebook, the super-unicorn of the 2000s, has dramatically increased in value – it is now worth $247Bn, up 102% since we last wrote. Now they are worth more than the sum of all other companies on last year’s list, and all the consumer companies on our current list. (PS: FB has also ‘aged out’ of our analysis, as it’s now 11 years old). There are now 9 “decacorns” (in our lingo, companies worth >$10bn), a 3x increase vs. our last analysis. To note, 5 of the 9 are largely mobile (Uber, Twitter, WhatsApp, SnapChat, Pinterest). History suggests the 2010s will give rise to a super-unicorn or two that reflect the key tech wave of the decade, the mobile web. Whichever company (or companies) comes to represent this key innovation (Uber?) will likely continue to accelerate in value as FB, Google and Amzn have over the past decade. 3) Consumer-oriented unicorns continue to drive the majority of value in our set: more companies, and higher average value per company. They also raise a lot of private capital. Consumer-oriented companies (companies where the primary customer is a consumer) contribute 72% of the aggregate value on our list (vs 60% last time), and comprise 55% of the companies on our list. They are worth $5.1Bn on average. 8 of the top 10 most valuable companies are consumer–oriented; consumer companies seem to reach higher peaks than enterprise companies. When founders start a company aiming to be super successful, they may not realize how many rounds of dilution may be ahead; or how many dollars of liquidation preference might be added (Heidi Roizen wrote an excellent post on this here). Cases in point – the consumer companies on our list have raised on average $535 million in six private rounds (that’s series E or beyond) versus $348 million in our last analysis, a whopping 54% increase. Seven consumer companies on our list have raised over $1 billion in private capital each. 4) Enterprise-oriented companies raise much less private capital; but increased fundraising has seriously reduced their capital efficiency. The average enterprise-oriented company (where the primary customer is a business) is worth $2.5 billion, less than half the average consumer company. To note, their private capital raised is $247 million on average, up 79% versus our last analysis. This increase has reduced their average capital efficiency significantly; from 26x in our last analysis, to 7.6x for the median enterprise company in our set. Conversely, 18% of our enterprise-oriented companies’ recent valuation is <4x their private capital raised: AppNexus, Automattic, Box, Cloudera, Lookout, MagicLeap and Simplivity. 5) E-commerce drives the most value of five primary business models, and SaaS companies have significantly increased their market share since our last analysis. We’ve also added a fifth business model category: Consumer Electronics/Internet of Things. E-Commerce companies (companies where a consumer pays for a good or service through the internet or mobile; including companies like Uber and Airbnb) continue to drive the most value (36%); they also raise the most private money ($683m on average! ), and deliver the lowest multiples (8x average) of valuation over capital raised. This is likely because of increased headcount and marketing costs versus other categories, lower margins, and lower public market comparable company multiples, which drive private valuations lower. Audience companies (the product is free to use for consumers, the company makes money thru ads or leads) drive the second-most value on our list (27%); they are 17% of companies on our list, down from 28% last time; have raised $352m; and are at a 16x multiple of value over capital raised on average. Enterprise software companies (where a business customer pays for larger scale software, often ‘on premises’ vs cloud-based; or hardware with software) have raised $268 million on average, and are down in “market share” of our list to 17% from 26% of companies; they drive 12% the value of our list, and a 17x multiple. SaaS companies (cloud-based software offered often via a ‘freemium’ or monthly model) have grown to 31% of our list (versus 18%), and 20% the value of our list. They are also among the more capital efficient companies on average in our set, raising $267m on average and are at a 18x return on private capital on average (excluding Veeva). We’ve added a new category: Consumer Electronics/Internet of Things, where the consumer pays for a physical product. Five companies make up 6% of list; they have raised $266 million on average and are valued at 18x private capital raised. An important note – 32% of our set has characteristics of broad or local network effects, where the value of the product/service gets better the more people are part of the system. 6) It has taken ~7 years on average before a “liquidity event” for the 39% who have ‘exited’ – not including the 61% of our list that is still private. The capital efficiency of these “private unicorns” is surprisingly low, which will likely impact future returns for founders, investors and employees. When starting a company, many founders may also not realize the journey ahead is more like an ultra-marathon than just a race. It took 6.7 years on average for 33 companies on our list to go public or be acquired (excluding outliers acquired within two years of founding – congrats Instagram, OculusVR, YouTube – you are outliers of the outliers!). Enterprise companies take one year longer to a “liquidity event” vs consumer companies. It’s a long journey, well beyond traditional vesting periods. Just 19 have gone public (23%). The average public market valuation is $8.9 billion. These companies went public after six private rounds of funding, and $329 million in private capital, delivering a 20x at today’s valuations (excluding Veeva and Fitbit) versus private capital raised. 14 have been acquired (17%). The sweet spot for an acquisition tends to be at ‘lower’ valuations – $1.5 billion on average, delivering ~16x on $102m in private capital raised (excluding WhatsApp and YouTube) on average. Given the valuation premium for private companies today and the increased overhead and quarter-to-quarter pressures of being public, staying private is clearly the preferred option in this market. 51 companies on our list are private; they’ve raised $516m in 6+ funding rounds to date on average, an astonishing 103% increase (vs $254) vs. our last analysis (for context, in the ‘good ol days’, Amazon raised $8m before going public, and Google raised ~$26m). Importantly, valuation vs private capital raised for these private companies is only 8x on average. Unless these companies ‘grow beyond’ their valuations at exit, this will likely drive lower than historical profits at liquidity for founders, employees and investors. When will this happen? Given how much capital our private companies have raised in the past few years, most likely have cash to fund 2-4+ more years of runway. If private capital is no longer available in the future, these companies will seek a public offering or acquisition. Some will demonstrate strategically justifiable metrics and have fantastic ‘up round’ exits; others may see liquidation preferences kick in which will negatively impact founders and employees; others may fulfill the adage “IPO is the new down round”, which has been the case for more than half of the public companies on our list. Or worse, some may become “Unicorpses” :)). The reduction in private company multiples is also a reflection on how venture capital has changed. Ten years ago, the best investors were praised for achieving a 20x return on their $15 million investment = a $300 million return. Many venture investors and their LPs now invest later, which is perceived to be less risky – and hope to achieve their $300 million by getting a 6x return on a $50 million later-stage investment. 7) Take heart, ‘old people’ of Silicon Valley – companies with clear product visions, and well-educated, tech-savvy teams of thirty-somethings with history together have built the most successes; 20-something founders, changing CEOs, and “big pivots” are a minority. The companies in our set were generally not founded by inexperienced, high-school dropouts. The average age at founding was 34 years old (same as our last post). Audience-based company founders were 30 at founding; e-commerce founders were 32; SaaS founders were 35; CE/IoT founders were 36; and enterprise founders were 39. To note, the founders of our 10 most valuable consumer companies were 29 on average when they founded their companies; and there are a number of young founders (< 25 years old at founding) in our set: Airbnb, Automattic, Box, DropBox, Lyft, Snapchat, Tumblr. But the founders of the two most valuable enterprise companies were 45 years old on average. Teams win: a supermajority of companies (86%) has co-founders: 2.6 on average. 85% of co-founders had history together – from school, work or being roommates, the majority having worked together previously. If at first you don’t succeed…76% of companies have founders with entrepreneurial history and a track record of founding something else previously. Only 12 companies have a sole founder, and none in the top 15 on our list. Unlike in our last analysis where all four sole-founded companies had liquidity events, only two of these companies (New Relic and Tumblr) have had exits. The overwhelming majority of companies (92%) start with a technical cofounder, and 90% have a founder with experience working in a tech company. It’s extremely rare for one of these companies to be started by someone who hasn’t worked in tech before. The few companies whose founders had no prior experience working in a tech are largely consumer-oriented companies, like Beats Electronics and Warby Parker. Education seems kind of important. About half our list has extremely well educated co-founders who are graduates of a “top 10” U.S. school3; but 19% also have a co-founder who dropped out of college. Most founding CEOs are scaling through the journey: 74% of companies are still led by their founding CEO, or were led by the CEO through a liquidity event. This says a LOT about the talent of these founding CEOs to scale from seed stage through multiple financings, leadership team changes, hundreds or thousands of team members, and in many cases global expansion, to build the most successful companies of the past decade. 26% of companies have made a CEO change along the way (versus 31% in our last post). Enterprise companies have a higher rate of changing CEO: 32% of enterprise, versus 22% of consumer companies. 83% of companies are working on their original product vision; only 17% significantly changed product focus in a big pivot. Consumer pivots are more prevalent than in enterprise. In our last analysis, there were just four (or 10%) companies who ‘pivoted’ from their original product vision; and all were consumer companies. The “pivot club” now includes enterprise companies like Slack and MongoDB; and consumer companies like FanDuel, Lyft, Nextdoor, Wish and Twitch. 8) San Francisco maintains its dominance as the new epicenter of the most valuable tech companies; cities like NYC and L.A. are growing in importance. The Big Apple (NYC) is the second-most important geography, home to 12 (14%) of our list, up from 8%. LA in the house. Los Angeles now has six in our set: Snapchat, Beats Electronics, OculusVR, TrueCar, JustFab, and the Honest Company. Boston, Austin and Seattle are additional hubs with 3, 2 and 2 companies, respectively. 9) Immigrants play a huge role in the founding and value creation of today’s tech companies. From what we can determine, about 50% of our list has at least one co-founder born in another country. These are remarkable people who in many cases spoke a different language and went to school elsewhere for formative years, then helped create billions in value here in the US. We’re grateful these founders and/or their families figured out how to enter and work in our country – and we wonder how many more jobs and how much more value might be created if it were easier for others with outstanding technical and startup skills to get visas to work here. 10) There’s still too little diversity at the top in 2015, but there is movement in a positive direction on gender. On our last list, there were no female CEOs. So we welcome the two companies on our list with female CEOs: Houzz and Gilt Groupe. And the 10% of companies with female co-founders (up from 5%): CloudFlare, EventBrite, FanDuel, Gilt Groupe, Houzz, NextDoor, Kabam, and The Honest Company. So while 2.4% of CEOs is little to celebrate, this is an improvement from zero. It is not easy to figure out from publicly available information, but we estimate about 30% of companies in our set have no females on the leadership team. The majority of female senior leaders we could identify are in CFO, VP HR, GC, Sales and CMO roles; we could only find a few companies with female leaders in product or engineering, which seems like a great opportunity for progress. And Kudos to Gilt Groupe, Lending Club, New Relic, and ZenDesk who seem to have among the most gender diverse teams in our set. From what we can tell, ~70% of companies in our set have no gender diversity at the board level. This also seems a huge opportunity to improve outcomes and send an important message from the top. We won’t call out the companies with no diversity on their leadership teams or boards – but they exist, and we hope they are paying attention to this important driver of outcomes and culture. Efforts like Sukhinder Singh Cassidy’s BoardList will help identify great candidates for these boards. To note: we aren’t able to track racial or ethnic diversity as well as we need to report; this is an important field we hope to track in a future analysis. The most striking takeaway for us from this analysis is the growth of “paper unicorns” and their surprisingly low capital efficiency. While we believe some increase is due to fantastic market fundamentals, much seems due to the low incentive to trade publicly, a fiercely competitive environment, and private capital flocking to growth that has caused companies to focus on ‘getting big fast’, and has also pushed valuations out of whack with public markets. Because many investors have protection through preferred stock, and many founders “take some off the table” in later stage rounds, when paper unicorns become public or acquired unicorns, non-founder employees will likely feel the most pain and disappointment if there is a negative gap between the exit value and today’s private market share prices. There are also many consistent lessons with our last analysis. These companies were largely founded by co-founder teams with clear product visions, history together, experience working in tech, track records of entrepreneurship, and with a technical founder on the team. All have opportunities to improve their outcomes and cultures by adding diversity to their teams and boards of directors. And, they were founded by committed leaders who are on a path to scale their businesses for a decade or more. The probability a founder could start with a scrappy dream, then develop the skills to lead through hundreds of product shipments, ups and downs, serial fundraisings and thousands of employees while maintaining the faith of their teams, investors and boards – seems quite unlikely. It’s really remarkable and this whole analysis could be an ode to these special founders and teams who are going the distance to achieve the improbable. So we continue to tip our hats to these 84 companies who delight millions of customers with fantastic products, are outstanding at fundraising, and recruit and retain team members in the most brutal recruiting environment we’ve known. They are the lucky/tenacious/genius few of the Unicorn Club, and we look forward to learning more about them, and their future compatriots. Many thanks to the Cowboy crew who helped with this: Joanne Yuan, Noah Lichtenstein, Michelle McHargue and Athena Chavarria; and Silicon Valley Insights who helped seed our dataset. 1 Our data is based on publicly available information from news articles, company websites, CrunchBase, LinkedIn, Wikipedia and public market data. It is also based on a snapshot in time (as of 7/16/15) and current market conditions, which were categorized as fairly “hot” in 2013 and now might be considered “steamy.” To emphasize, our dataset includes only US-based, VC-backed software and internet-oriented companies. Impressive, highly valued companies like SolarCity, Tesla, Theranos, SpaceX, FlipKart, XiaoMi, SuperCell, Arista Networks and Shutterstock are not included in our analysis. 2 Figuring out the denominator to unicorn probability is hard. The NVCA says over over 21,000 internet-related companies were funded since 2005; Mattermark says 24,000; and the CVR says 20,000 companies are angel funded per year. So we assumed a ballpark 60,000 software and Internet companies were funded in the past decade. We’d like to acknowledge some awesome companies who have graduated from our data set. We missed a few impressive companies when we published this analysis in November 2012; and some also joined in the past 1.5 years, but then aged out; these include Demandware, GrubHub, Indeed, Mandiant, and Trulia. A few companies we were tracking in our set fell below a $1bn valuation before publishing, including Castlight Health, Fab.com, OnDeck, RocketFuel and Whaleshark Media.